Dredging of access/flotation canals for construction of I-10 resulted in increased salinity & altered hydrology that exacerbated conversion of wetland vegetation into shallow open water bodies. Land loss is estimated to be -0.543 percent/year based on USGS data from 1984 to 2011 within the extended project boundary. The primary goal is to restore marsh that converted to shallow open water. Project implementation will result in an increase of fisheries and wildlife habitat, acreage, and diversity along with improving water quality. The proposed project will provide a protective wetland buffer to the railroad and I-10, the region’s primary westward hurricane evacuation route, and complement hurricane protection measures in the area. The proposed solution consists of the creation of 762 acres of emergent wetlands and the nourishment of 140 acres of existing wetlands using dedicated dredging from Lake Pontchartrain. The marsh creation area will have a target elevation the same as average healthy marsh. It is proposed to place the dredge material in the target area with the use of retention dikes along the edge of the project area. If degradation of the containment dikes has not occurred naturally by Target Year 3, gapping of the dikes will be mechanically performed. Successful wetland restoration in the immediate area (PO-17 constructed in 1994) clearly demonstrates the ability for these wetlands to be restored using material from a sustainable borrow area (outlet end of Bonnet Carre Spillway). Engineering monitoring surveys of the marsh creation area and borrow area are planned as well. This project is located in the Pontchartrain Basin (Region 1), St. Charles Parish. It is bounded to the north by the railroad running parallel to I-10, to the west by the marsh fringe just east of Bayou LaBranche, to the south by Bayou Traverse and to the east by marsh fringe west of a pipeline canal. This project is on Priority Project List (PPL) 21.
crisis. CWPPRA was the first federal, statutorily mandated program with a stable source of funds dedicated exclusively to the short- and long-term restoration of the coastal wetlands of Louisiana. Between 1990 and 2016, 108 restoration projects were constructed through the CWPPRA program. These projects include diversions of freshwater and sediments to improve marsh vegetation; dredged material placement for marsh creation; shoreline protection; sediment and nutrient trapping; hydrologic restoration through outfall, marsh, and delta management; and vegetation planting on barrier islands. The coastal protection and restoration efforts implemented through numerous CWPPRA projects require monitoring and evaluation of project effectiveness. There is also a need to assess the cumulative effects of all projects to achieve a sustainable coastal environment. In 2003, the Louisiana Office of Coastal Protection and Restoration (now CPRA) and the U.S. Geological Survey (USGS) received approval from the CWPPRA Task Force to implement the Coastwide Reference Monitoring System (CRMS) as a mechanism to monitor and evaluate the effectiveness of CWPPRA projects at the project, region, and coastwide levels (Steyer and others, 2003). The CRMS network is currently funded through CWPPRA and provides data for a variety of user groups, including resource managers, academics, landowners, and researchers. The effectiveness of a traditional monitoring approach using paired treatment and reference sites is limited in coastal Louisiana because of difficulty in finding comparable test sites; therefore, a multiple reference approach using aspects of hydrogeomorphic functional assessments and probabilistic sampling was adapted into the CRMS design. The CRMS approach gathers information from a suite of sites that encompass a range of ecological conditions across the coast. Trajectories of changing conditions within the reference sites can then be compared with trajectories of change within project sites. The CRMS design not only allows for monitoring and evaluating the effectiveness of each project but will also support ongoing evaluation of the cumulative effects of all CWPPRA projects throughout the coastal ecosystems of Louisiana. Simulations made by using the resampling methodology described in Steyer and others (2003) indicated that 100 randomly selected reference sites would accurately represent the true composition of coastwide vegetation at a 95 percent confidence level. However, in order to detect a 20 percent change in coastal marsh vegetation between two time periods, at least 80 percent of the time, approximately 400 reference sites were needed. Because of land rights and other technical issues, 390 sites with a fixed annual sampling design were approved and secured for CRMS data collection. These 390 CRMS sites are located within nine coastal basins and four CWPPRA regions, covering the entire Louisiana coast. Site construction and data collection began in 2005. Because of the quantity of products and data that will be produced over the lifetime of the CRMS project, a website (http://www.lacoast.gov/crms) was designed to be a one-stop shop for CRMS information, products, and data. The ecological data available through the website are linked to the official Louisiana CPRA database – the Coastal Information Management System (CIMS), which houses all CWPPRA monitoring data, on topics such as the following: hydrology, herbaceous marsh vegetation, forested swamp vegetation, soil properties, soil accretion, and surface elevation. Data provided by the Louisiana CPRA are available for downloading at https://cims.coastal.louisiana.gov/. The basic viewer (under Mapping) on the CRMS Web site provides a user-friendly interface for viewing information on specific sampling sites, including photos, data summaries, and report cards. Analytical teams are developing mechanisms by which individual sampling sites can be assessed in relation to other sites within the same marsh type, hydrologic basin, and CWPPRA project. These multi-scale evaluations will be presented on a “Report Card” tab within the basic viewer. The CRMS program is as dynamic as the coastal habitats it monitors. The program continues to develop new products and analysis tools while providing data for model improvement and scientific research. The CRMS Web site is the current dissemination mechanism for all activities related to the program. For a beginner’s guide to retrieving CRMS data, visit https://www.lacoast.gov/new/Ed/CRMS_Manual.pdf. Steyer, G.D., Sasser, C.E., Visser, J.M., Swensen, E.M., Nyman, J.A., and Raynie, R.C., 2003, A proposed coast-wide reference monitoring system for evaluating wetland restoration trajectories in Louisiana: Environmental Monitoring and Assessment, v. 81, p. 107–117. Altered hydrology, drought stress, saltwater intrusion and hurricane induced wetland losses have caused the area to undergo interior marsh breakup. Recent impacts from Hurricane Rita in 2005 and Hurricane Ike in 2008 have resulted in the coalescence of Oyster Lake with interior water bodies increasing wave/wake related erosion. Based on USGS hyper temporal data analysis (1984 to 2011), land loss for the area is -0.75% per year. The subsidence rate is estimated at 0.0 to1.0 ft per century (Coast 2050, Mud Lake mapping unit). The project boundary encompasses 809 acres. Specific goals of the project are: 1) create 510 acres of saline marsh in recently formed shallow open water; 2) nourish 90 acres of existing saline marsh; 3) create 17,500 linear feet of terraces; and, 4) reduce wave/wake erosion. Approximately 510 acres of marsh would be created and 90 acres would be nourished. Sediment needed for the fill would be mined approximately one and a half miles offshore in the Gulf of Mexico. Half of the created acres would be planted. Tidal creeks and ponds would be constructed prior to placement of dredged material and retention levees would be gapped to support estuarine fisheries access to achieve a functional marsh. Approximately 17,500 linear feet of earthen terraces would be constructed and planted. This project is in Region 4, Calcasieu-Sabine Basin, located west of the Calcasieu Ship Channel and south of the west fork of the Calcasieu River. The Caminada Headland has experienced some of the highest shoreline retreat rates in Louisiana. Historically the shoreline has migrated landward at about 40 feet per year. Between 2006 and 2011, shoreline migration increased dramatically, exceeding 80 feet per year in near Bay Champagne and 110 feet per year in the Bayou Moreau area. The increased losses occurred in the wake of Hurricanes Katrina and Rita in 2005 as the breaches remained open for an extended length of time. The losses were exacerbated by Tropical Storm Fay and Hurricanes Gustav and Ike in 2008. Significant prolonged breaches greatly increase the net export of sediment from the headland. In addition to the shoreline migration, the area is also experiencing high loss rates of interior marshes. As the beach and dune continue to migrate landward, overwashed sediment will be lost into newly formed open water and land loss rates will be exacerbated. The continued deterioration of Caminada Headland threatens thousands of acres of wetland habitat as well as critical infrastructure, including Port Fourchon, LA Highway 1, and the lower Lafourche levee system. 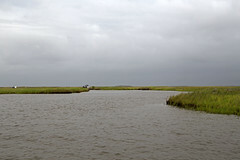 The goals of this project are to: 1) Create and/or nourish 385 acres of back barrier marsh, by pumping sediment from an offshore borrow site; 2) Create a platform upon which the beach and dune can migrate, reducing the likelihood of breaching, improving the longevity of the barrier shoreline, and protecting wetlands and infrastructure to the north and west. The proposed project is expected to slow the current trend of degradation in the headland. This project would create 210 acres of back barrier intertidal marsh and nourish 175 acres of emergent marsh behind 3.5 miles of the Caminada beach using material dredged from the Gulf of Mexico. The marsh creation and nourishment cells are designed to minimize impacts on existing marsh and mangroves. Assuming some natural vegetative recruitment, vegetative plantings are planned at a 50% density, with half planned at project year one and half planned at project year 3. Containment dikes will be degraded or gapped by year three to allow access for estuarine organisms. The project area is defined as the area south of Louisiana Highway 1 between Belle Pass and Caminada Pass, directly behind Caminada Headland beach covering areas in and around Bay Champagne and areas east of Bayou Moreau. The Caminada Headlands Back Barrier Marsh Creation project is located along the Louisiana coastline in LaFourche Parish in CWPPRA Planning Region 2. A kick-off meeting was held in June 2014. The project team has completed preliminary engineering and design, environmental compliance, real estate negotiations, operation & maintenance and monitoring planning, and a cultural resources investigation, all to the 95% design level as required by the CWPPRA standard operating procedures. The 30% design review meeting was held July 28, 2016 and the 95% design review was held on October 28, 2016. The Phase II Request for construction funding was presented to the CWPPRA Tech Committee on December 7, 2016. This project is on Priority Project List (PPL) 23. The present location of the Mississippi River has been confined by levees constructed in response to the devastating flood of 1927. Although necessary for protecting life and property, the levees prevent the natural processes of delta building and sediment deposition that are vital for sustaining wetlands. Without this nourishment, the wetlands will eventually succumb to subsidence, storms, and anthropogenic impacts. The CWPPRA program has been finding solutions to optimize river resources and help rebuild wetlands with minimal impact to other stakeholders. Controlled diversions route river water through strategic locations in the levees to feed starving marshes. Crevasses, or cuts, are constructed through levees to allow passive creation of smaller deltas. Siphons suction fresh river water and direct flow into wetlands suffering from saltwater intrusion. Water-control structures and channel maintenance help distribute river water diverted from large-scale structures constructed under other authorities. The river presents the greatest opportunity for rebuilding land but also the greatest challenges, as competing needs are inevitable. The human and natural environments must be able to coexist because they are inextricably connected. Together with stakeholders, CWPPRA projects are helping to reverse land loss on an ecosystem scale and support the economy on which coastal Louisiana has come to depend.